Slowly but surely, we are chipping away at the living room progress! The other day, Robert and I tackled a huge mess that had been driving us crazy since the day we moved in. We’ve come a long, long way in here since it was bright sunshine yellow and beige. Painting the walls bright white and the doors black made this room feel 10 times larger. And adding IKEA furniture, a Craigslist coffee table, free botany prints, and a super fab ceiling fan has definitely made it my favorite room in the house. Some of y’all suggested sticking all of it in a closet and getting an infrared system, but we didn’t really have a nearby closet to put it all in except for one at the opposite end of the house near our front door. 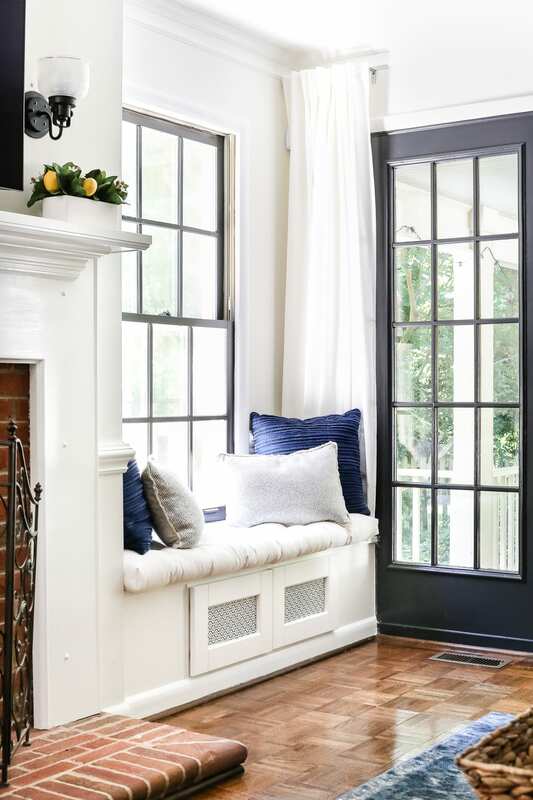 We were already thinking window seats would be kind of perfect on either side of our fireplace, so bingo! Problem solved. Only we took a shortcut. Enter this itty bitty kitchen cabinet. 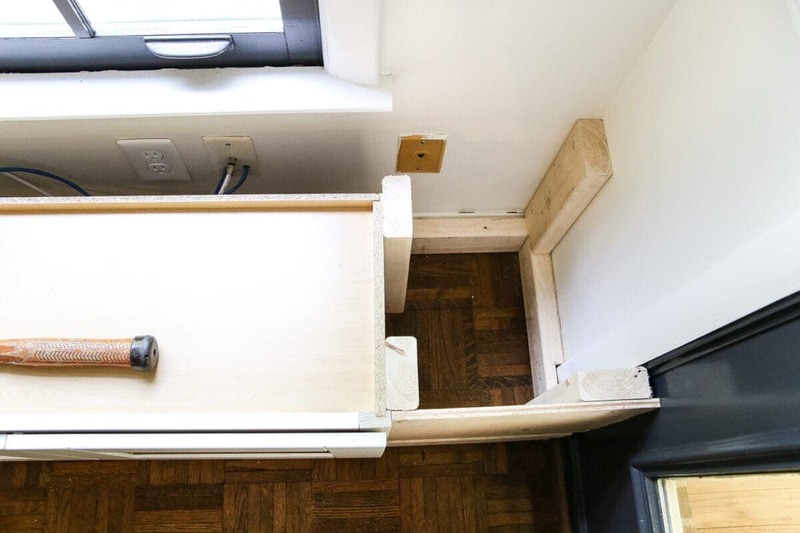 You can absolutely build a window seat from scratch if you want, but it is way easier when a lot of the work is done for you. I was hoping I could squeeze two kitchen cabinets in the space but the width of it was just 2 inches shy of being able to make that work. The whole project took us about 8 hours. Woot woot weekend warrior status! 1. 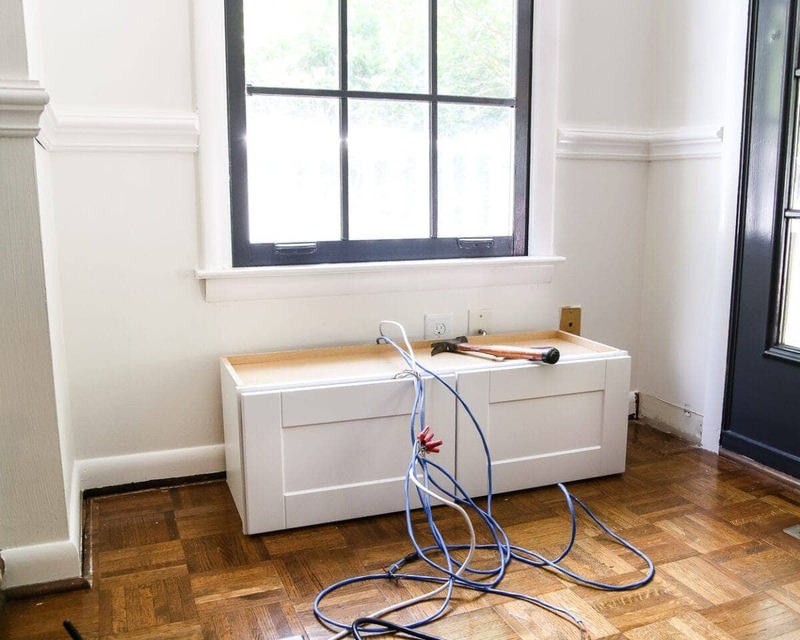 To prep the space, we used a crowbar to remove the existing baseboard and quarter round strip. (We kept our quarter round intact and set it aside for later since it matches our hardwood floor.) From there, we measured to get the exact width we needed to start building our seat. 2. 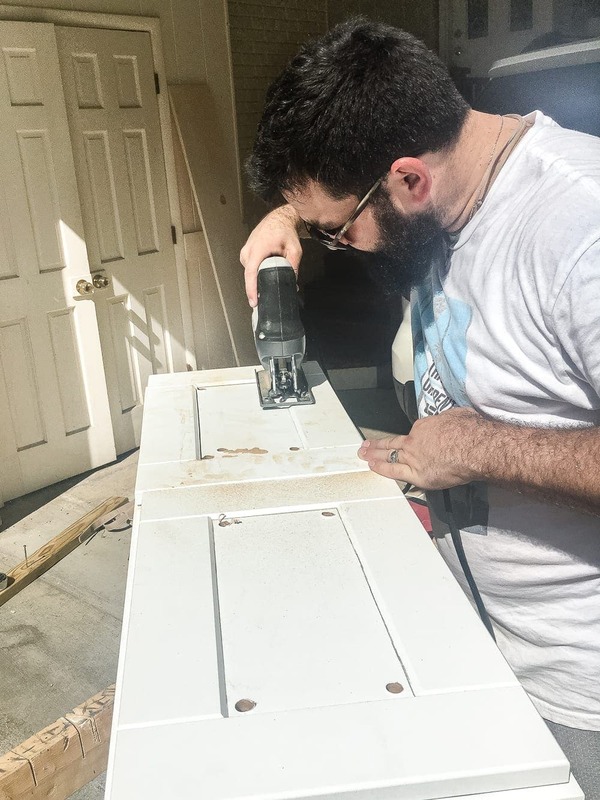 We built a base, first, by cutting 2 of the 2″x4″ boards with the circular saw to fit the width of our window space and placed braces of 2″x4″s between the front and back to support the width of the kitchen cabinet. 3. Then, we nailed the base to the back and sides of the wall in our nook. 4. To start securing the cabinet, we “dry fit” it on top of the base and measured the height to start cutting braces. And also to make faces like usual. 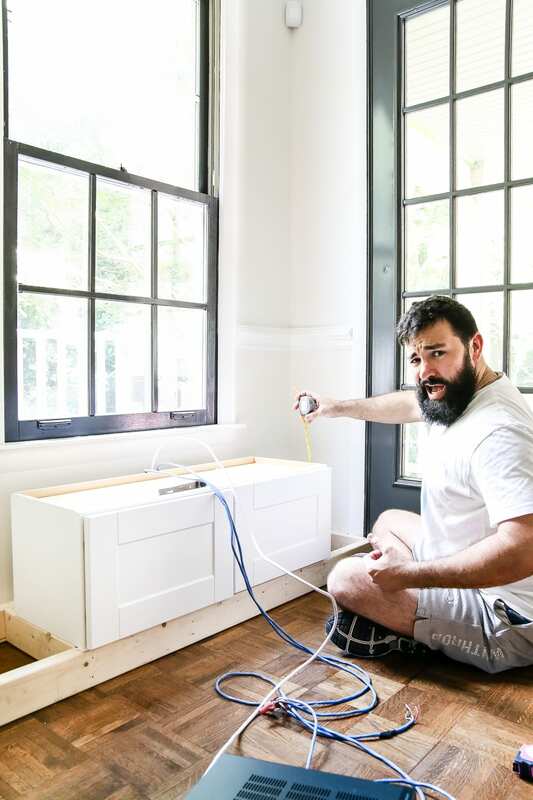 If you’re gonna DIY, you gotta have a touch of crazy. 5. Using the measurements from our “dry fit” cabinet height, we used our circular saw again to cut 2″x4″ boards. 6. 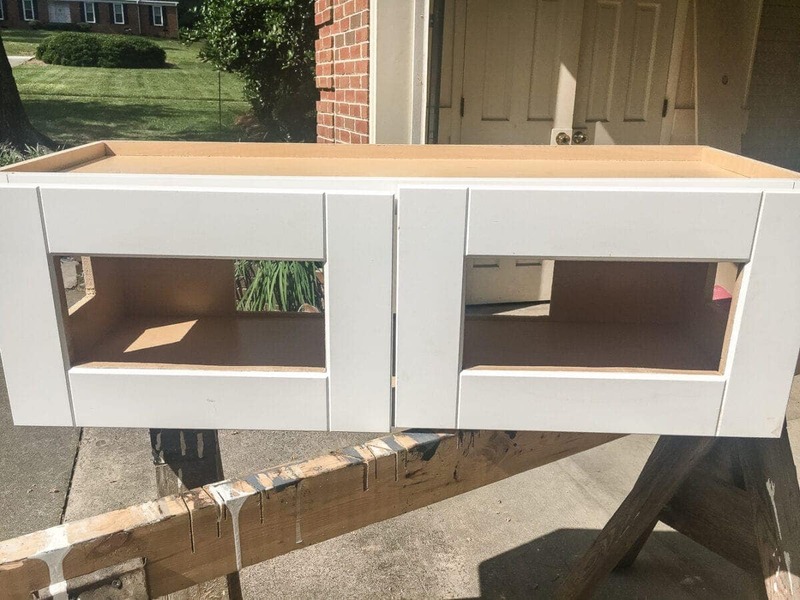 We took the cabinet back outside at this point too to go ahead and cut holes in the back with a jigsaw so cords could be fed through to the outlet and TV. 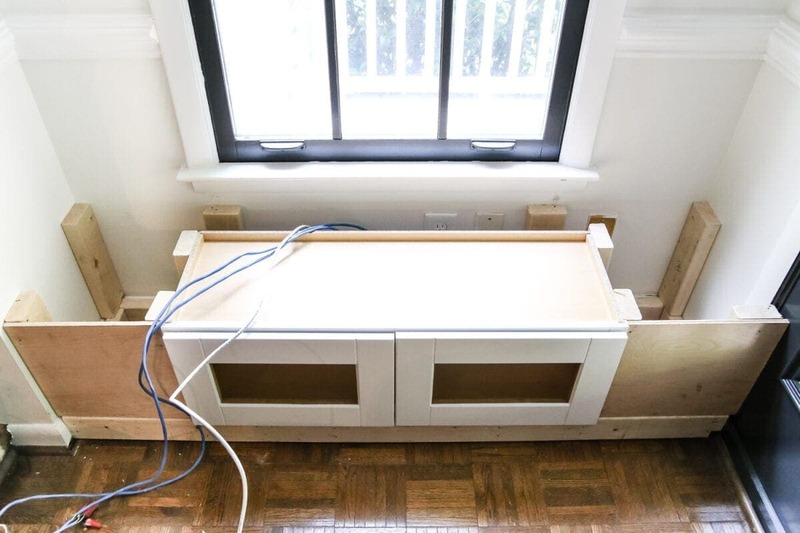 We used the jigsaw at this point to also cut out the front of the cabinet doors so that the boxes can later receive a signal from our remotes. 7. 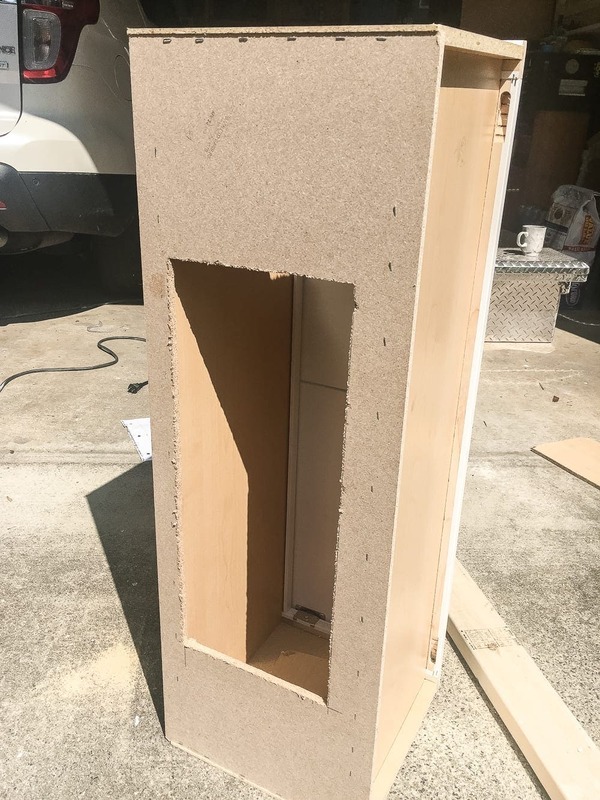 Once we put the cabinet back on top of the base, we screwed the 2″x4″ braces to the sides and to the corners of our box. 8. To enclose the front, we measured the space between the cabinet and the wall to cut a plywood piece. 9. 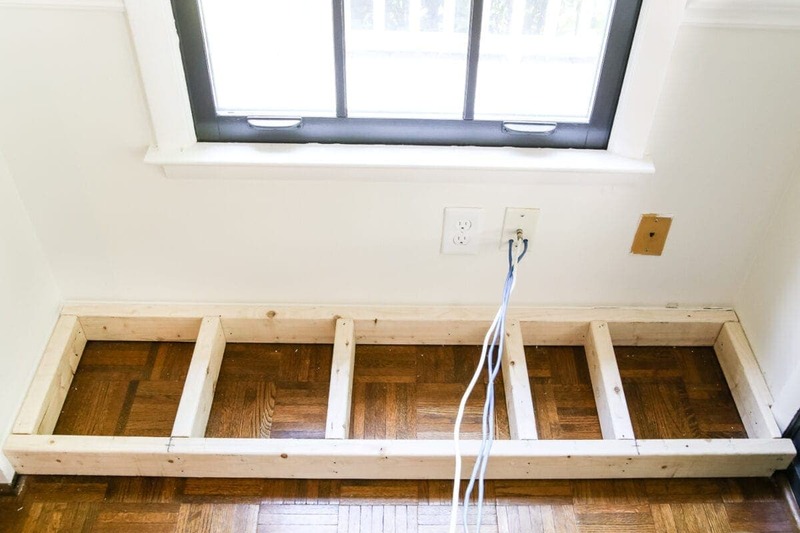 From there, we lined up the cut plywood piece and pressed it flush against the front two 2″x4″ braces for support and nailed into place. 10. We repeated the same process on the other side of the box using 2″x4″ braces and cut plywood too. 11. To add support to the back of the seat, we cut two more 2″x4″ braces and nailed them to the back wall. 12. On the front, we finished it off by nailing on a baseboard strip along with our old quarter round. 13. For the top, we measured the width of the space again and cut the 1″x12″ and 1″x10″ boards to the top of the cabinet and 2″x4″ braces. 14. Once we caulked all of the cracks, wood filled and sanded all of the nail holes, primed, and painted, this little seat looked like it’d been there all along. 15. 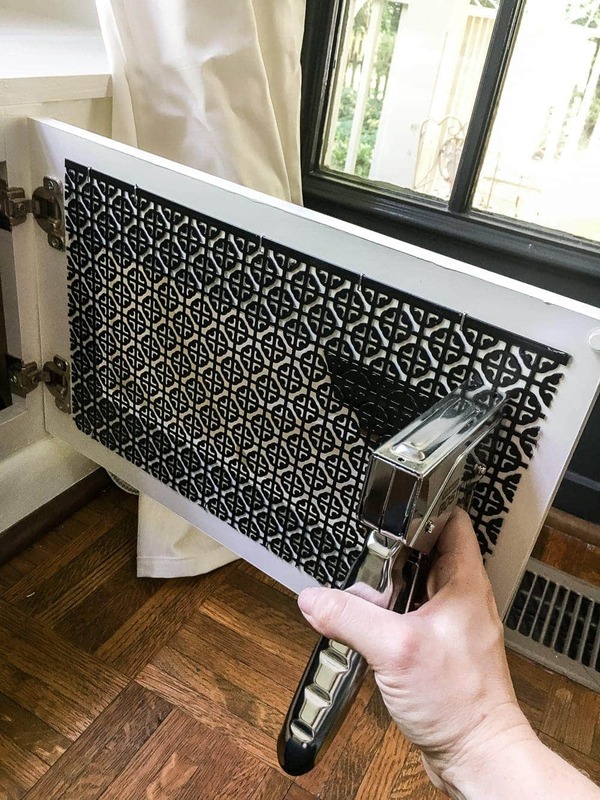 As a finishing touch, I cut the two aluminum sheets with metal snips slightly larger then the cabinet door openings and stapled them to the backs of the cabinet doors. I primed and painted the sheets on the doors with the same paint I used on the rest of the seat. And voila! A place to hide all of our electronic madness and a cute little reading nook or a bench for overflow seating when we have a lot of friends and family over. We could have probably built it from scratch, but it would have taken a while longer. Instant gratification for the win! Well, 8 hour gratification but whatever. To make sure everything stays cool and running smoothly, we put these dual electronic fans inside. They’re completely silent and work perfectly! I had a hard time finding a cushion for this seat since it was a custom job, so I had to order one on Amazon. (I’m sure the cushion could be another DIY project, but all hope is lost when it comes to my sewing skills.) This one I found is super soft and comfy and is made with Sunbrella fabric, so if Olivia spills juice all over this, it’ll be no big deal. 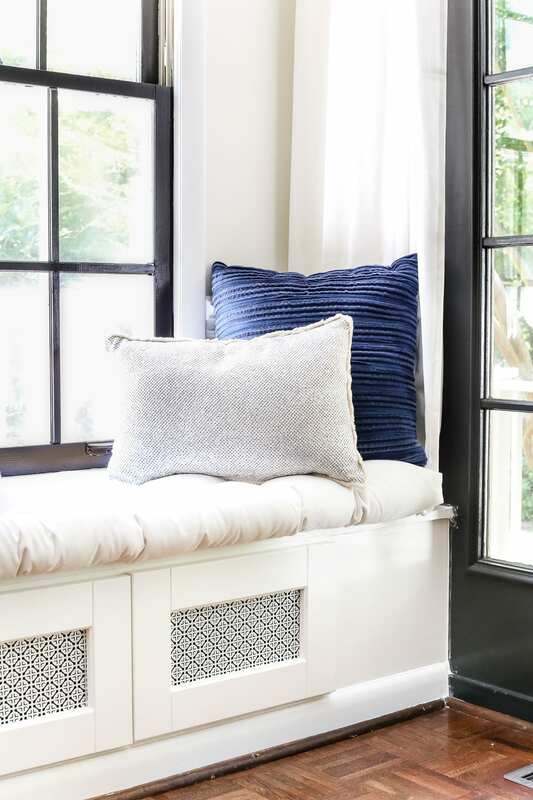 I picked up these blue pillows and metallic pillows at Target the other day too since they had beautiful textures and the exact colors I was looking for to pick up the silvery blue shades in our rug. We still have some cleaning up to do around the door with the paint job, but we’ll get to it soon. To hide the cords between the TV and seat, I wrapped them in cord covers, stuck them into the corner of the wall, and painted the covers to match the wall color (Benjamin Moore Swiss Coffee). You barely notice them! I’ve debated whether I should hang curtains on either side of this window, but I’m thinking less is more. 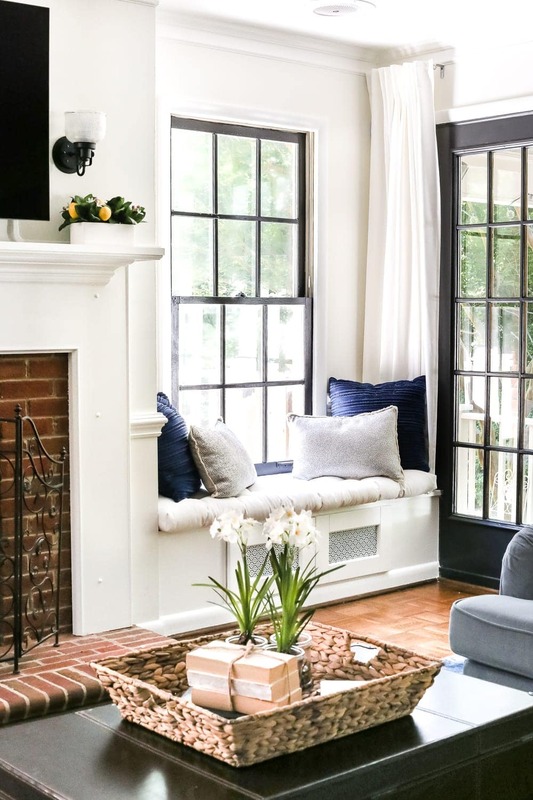 Eventually, we would love to put a matching window seat on the other side of the fireplace, but we have to rip out an old non-functioning door first and replace it with an actual window before we can do that. Next on the living room to-do list is to tackle that brick. I’m trying not to psych myself out over here. A lot of you voted to German smear it and some of y’all have said to just clean it and leave it raw or paint the whole thing white entirely. Ack! So we’ll see what happens. Until then, I’ll just keep staring at it until it tells me what to do. P.S. If you want to know where to get any of the rest of our living room decor, since you guys sometimes ask, here’s the list. 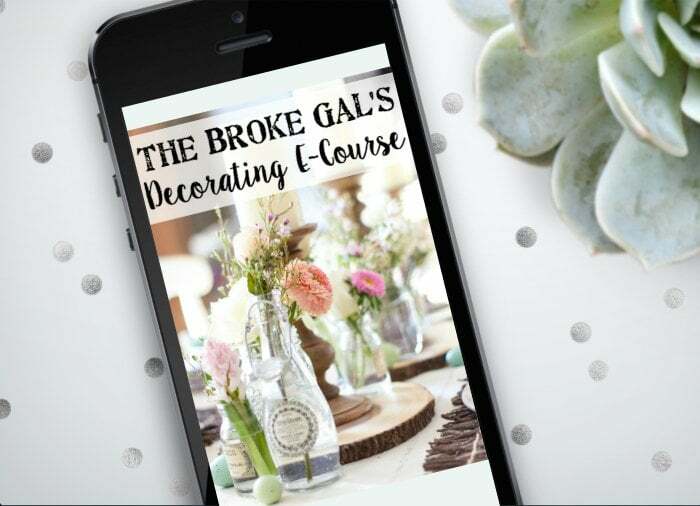 Get budget decorating ideas, DIY tutorials, and access to the free printable library right in your inbox! Very cute and so practical Lauren! 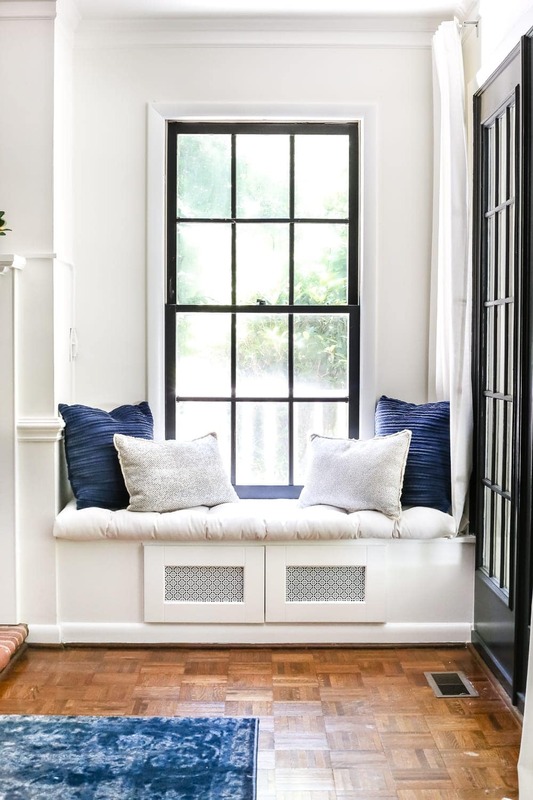 Love your window seat! What a great place to read a book. 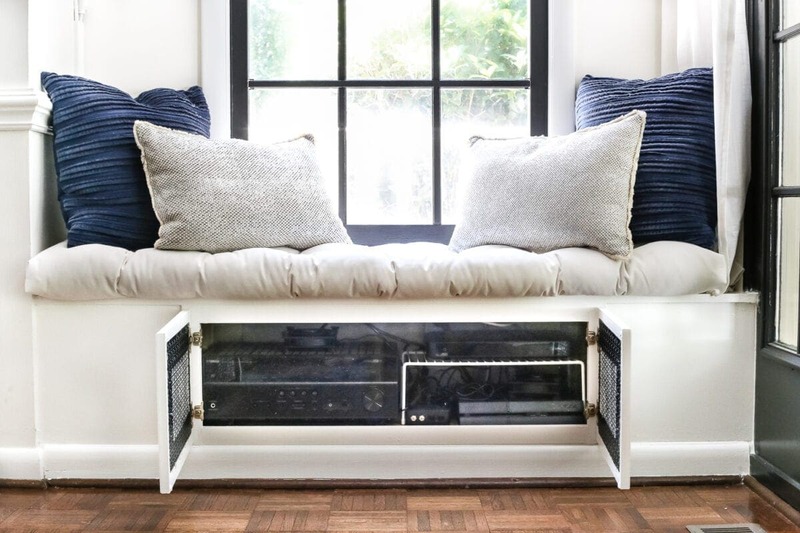 Such a good idea to use a cabinet. You are making a lovely home. Perfection to look at AND problem solved. Kudos! I love all of your projects and I am always excited to see that I have a new email from you. You are so talented. 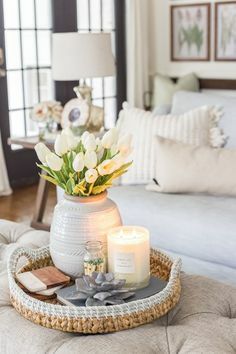 What I want to know is how you find all of the beautiful accessories for styling your home. Do you shop everyday? Are you just lucky or do you know what days the stores get new shipments? Thank you for sharing all of your great ideas! This looks absolutely beautiful! I just love the window seat. Such an awesome (and gorgeous!) 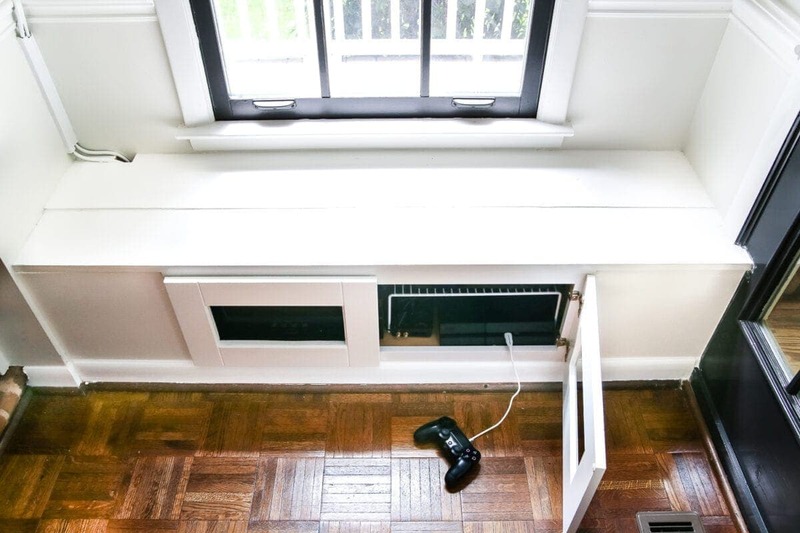 way to hide those pesky cords. Beautiful job! It’s lovely – great that it has opening doors too & I love your creative thinking. 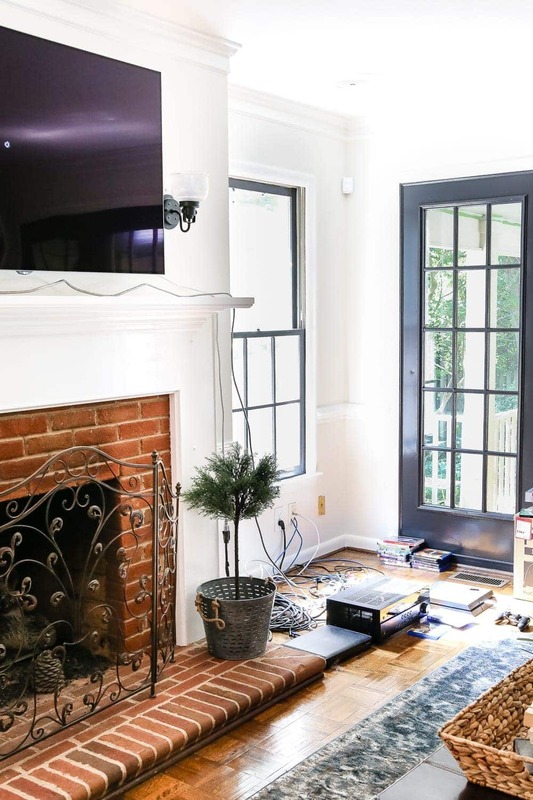 With the fireplace, I think I’d paint the hearth to match the surround as it’s an attractive shape with the rounded bricks. We painted a wall in our ‘sunroom’; it was the ugliest (mis-matched, filled & patched-up) brick wall of the whole house but it looks absolutely beautiful just painted cream, and now even the rough bricks feel smooth. 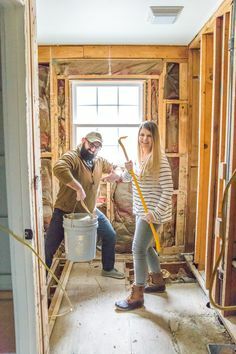 Then depending on whether you’re going to have a real fire in there consider painting the inside walls with high-heat-proof paint to lighten it up, and put some very pretty tiles on the front bricks, facing into the room & making it a very eye-catching feature. I’d put a photo of my little tiled fireplace but am not sure how/where to post it. great idea! love how it turned out. if you want a window covering, I would suggest a roman shade instead of curtains. Great solution to a pesky problem. Looks wonderful!! and clever you, hiding your cords with those little paintable cord thingies. (technical term) I thought I was the only one doing that……German schmear can look really messy and over the top if not done properly. I highly encourage practice on something first before tackling something as important as your fireplace. So just think about it. I love painted brick, but the German Schmear is a beautiful look. But as with many of our DIY’s there’s a learning curve. maybe there’s a youtube tute! That came out fabulous! I have wanted a window seat forever. But I have never had a window in a spot where I could add one. You lucked out! I love the blue area rug. But when I click on the link the one on Amazon says it’s blue but it looks grey. The one in your picture looks bright blue. Can you please verify the colors in your rug. Thank You. I’m loving everything you are doing to your new house. This is a genius idea. So clever! I especially like the way you took out the center panels from the doors and put in the black grates for cooling. What a great idea and great result! I would love to have such a nook. 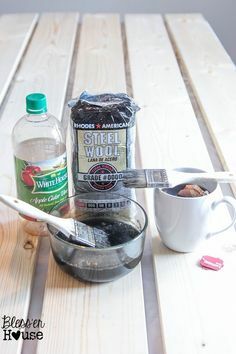 About the fireplace, I’ve read a blog (don’t ask me where) that was about painting a brick fireplace black. Matt dark black. Maybe that could work with your dark windows and doors. The picutre I remember combined the black bricks with a metallic screen and a white mantle. You could probably combine it the same and add some blue details? This looks fabulous! Thank you so much for the Amazon link. We built a window seat in our son’s room 7 years ago and it still doesn’t have a cushion! Now I can order one! 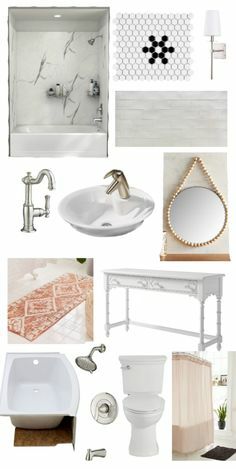 Lauren, I’m so just stinkin’ excited about this project in BHG! I would have spewed coffee too! It’s so fun to watch you use your God-given gifts. All of us little bloggers are rooting for you!!! Great work! You are so talented and I am impressed with your work. I can’t wait to give this a try. Thanks and keep sharing. I am trying to get a closer look of the cord covers. Where are they exactly? 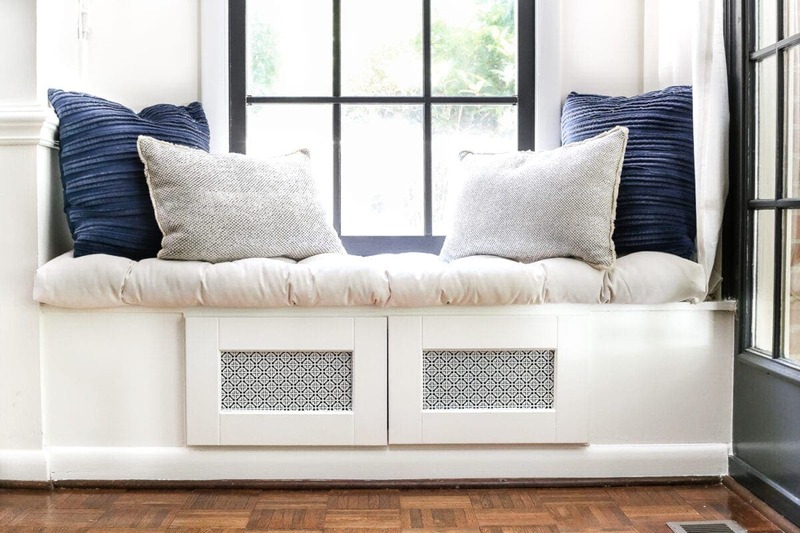 I love, love, love the window seat, by the way! I painted them to match the wall color so it’s great you can barely see them. 🙂 They are in the corner running up from the seat and over towards the fireplace. The link is in the post where to buy them. 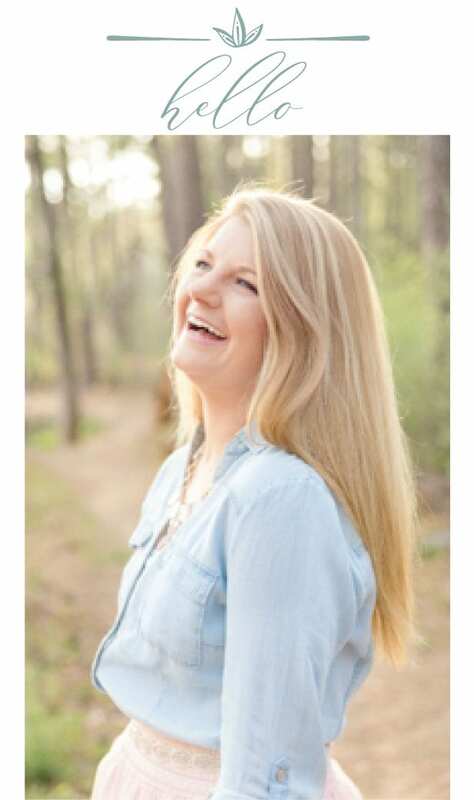 I’m Lauren, wife, mother, dog person, Southern gal, coffee addict, DIY fanatic, builder grade house owner, and lover of all things eclectic cottage. Don’t be a stranger! Copyright © 2019 Bless'er House. Web Design by Viva la Violet. Thrifting tricks, home decor shopping secrets, budget design strategies, and inspiration right in your inbox. Your information will NEVER be shared or sold to a 3rd party. Pinky promise!